Every now and then I will come across a work, either a play, a film, or in this case a documentary, that fascinates the hell out of me. If it’s something that I don’t think is too well known, and I feel compelled to share it with you all, then I’ll do my best to convey why you must go and see it ASAP. So, without further ado, I present to you my first “mind blown…” Dennis Rodman’s Big Bang in Pyongyang on Showtime. I have always been intrigued by the whole North Korean situation and the complete mess of reports as to the actual state of things inside the country. There is the government’s propagandized images of life in North Korea, making it look like a rich, bustling country. And then there is actual footage that has been smuggled out, revealing the disparate nature of its starving citizens outside of the capital. Unjust executions, threats of nuclear war, and all centered around a boyish, pudgy dictator who couldn’t look less threatening. It’s all stranger than fiction. Enter Dennis Rodman. Yea…what? While he is the embodiment of strange, what could possibly relate him to one of the most mystifying countries in the world? Well he sort of became buddies with Kim Jong Un, the grand marshal himself. 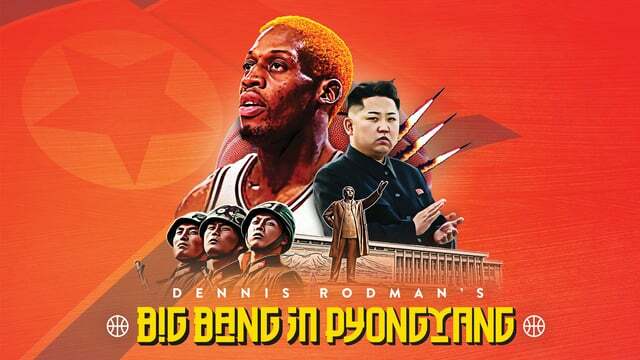 When you watch the documentary, you’ll learn of the origins of this very odd friendship, but the important part to note is that somewhere along the way, Rodman proposed an exhibition basketball game between North Korea’s best players and some former players of the NBA in honor of Kim’s 31st birthday. Yea…what? What I want to stress to you is how ridiculously unique the portrait of Dennis Rodman is in this story and how it should not be missed. At first glance, Rodman seems completely naive, possibly blinded by Kim’s methodical hosting tactics. With lavish getaways complete with jet skiing and fine dining, the grand marshal knows that Rodman is the world’s biggest celebrity to visit his isolated nation, so he gives him the royal treatment in the hopes that Rodman will champion how great of a leader Kim is. But it’s not as if Rodman is politically unaware; he knows that as far as the United States is concerned, he is fraternizing with the enemy. Rodman keeps repeating the phrase “I just want to open doors,” even through tears of frustration in the wake of death threats and personal strife with friends and family, all because of what he is trying to accomplish. While he may not be completely tactful in his approach, Rodman is up to something, an idea, which isn’t the worst…there is precedent, after all, in Ping-Pong Diplomacy of 1971. As the game draws closer, Rodman’s alcoholism comes back to plague him. He becomes confrontational and obnoxious far too frequently for someone who is trying to bridge an infinite chasm between two nations. He is too out of his mind to coach the teams, he nearly blows a group interview with CNN amidst rumors that the game will be cancelled. But at the end of the day, the game is played. It is very competitive and filled with sportsmanship. The teams mix up in the second half so as to have both nations play together, a very touching idea of Rodman’s. Low and behold, after the final whistle, two groups of men, on the brink of war politically, shake hands and high five with nothing but respect for each other. Should we cut Dennis Rodman some slack? Yea…what?